Folsom Dam’s auxiliary spillway, also known as the Joint Federal Project or JFP, is a component of Reclamation’s Central Valley Project. The cooperating agencies, Reclamation, U.S. Army Corps of Engineers, Sacramento Area Flood Control Agency, California Department of Water Resources and the Central Valley Flood Protection Board formed an unprecedented partnership to provide enhanced flood protection for the Sacramento area – one of the most at-risk communities in the nation. The auxiliary spillway was constructed adjacent to Folsom's main concrete dam, 23 miles northeast of Sacramento. 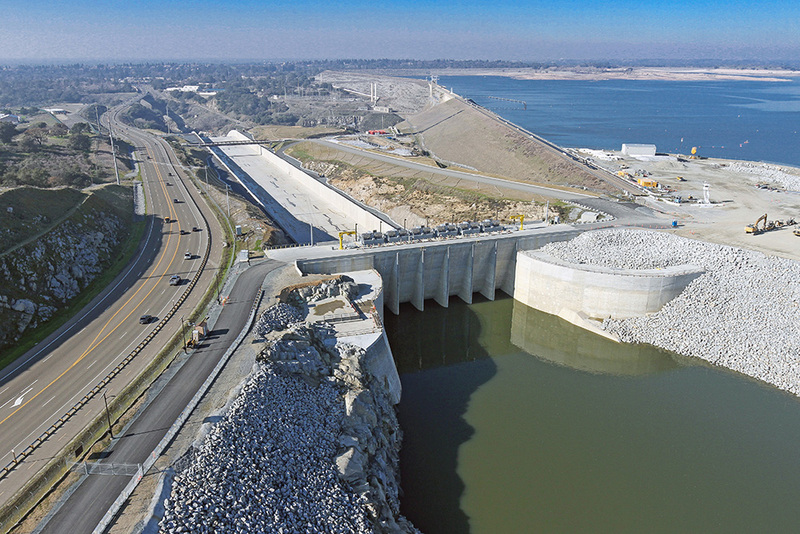 Substantially completed in October 2017, it includes a 1,100-foot-long approach channel beginning in Folsom Reservoir, a concrete control structure with six bulkhead and six radial gates, a 3,100-foot-long auxiliary spillway chute, and a stilling basin that acts as an energy dissipation structure as water discharges and enters the American River. With the ability to operate the new spillway, Reclamation is able to better manage large floods by safely releasing more water from Folsom Reservoir earlier in a storm through both the spillway gates on Folsom Dam and the new control structure’s radial gates (which sit 50 feet lower), reducing hydrologic risk and leaving more storage capacity in the reservoir.